“Archipelago is my favourite word,” my brother once told me. The word itself rolls around the mouth with a self assured grace while its physical embodiment conjures up images of strings of islands floating in oceans and seas like fallen constellations. Before I moved to the Canary Islands I mistakenly assumed that islands within an archipelago would bear a major resemblance to each other. I could not have been more wrong. Experience has taught me that time and weather can mould islands within a short distance of each other in very different ways. So how different would one entire archipelago could be from another? 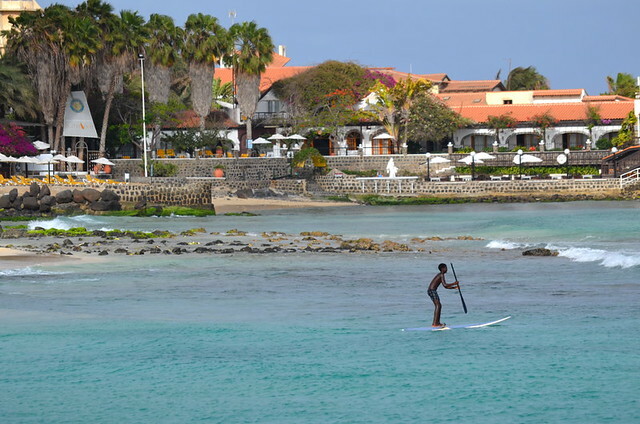 Cape Verde has long been on our radar, if for no other reason than to see if the common claims of ‘there’s nothing there except sand and sea‘ that we hear from people who book a week all-inclusive in Sal, were really true. Lying just 1600km south west of the Canary Islands, until recent years a trip from Tenerife would have meant a flight to the UK in order to fly all the way back. So when Binter Airlines added Cape Verde (Cabo Verde) to their destinations, the islands finally opened up for us and this May we set off for a week’s hiking and exploring. The first and immediate difference that strikes you between The Canary Islands and Cape Verde is just how African Cape Verde is. 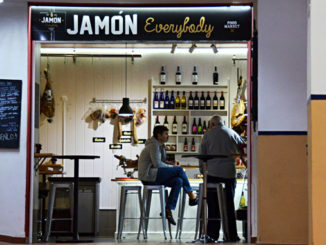 Here in the Canary Islands we often see reference to the islanders’ own perception of their identity as being much more closely aligned to their African neighbours than to their Spanish sovereigns but in reality, the connection is far more South American than African. Not so Cape Verde. Despite being considerably further away from the African mainland (there’s 450km of ocean between Africa and the nearest Cape Verde island whereas Fuerteventura lies a mere 60km off the coast of Morocco) and despite having been a Portuguese colony right up until the late 20th century, these islands are African, and all the more beguiling for it. The second thing that strikes you is the difference in living standards. We’re not talking Mumbai slums or starving children by any stretch but we are talking an entirely different level of economy from the wealthy Canary Islands. Outside of Sal’s capital, Espargos, and the tourism developments of the south coast, there is virtually no development and no buildings, just endless brown, windswept earth. 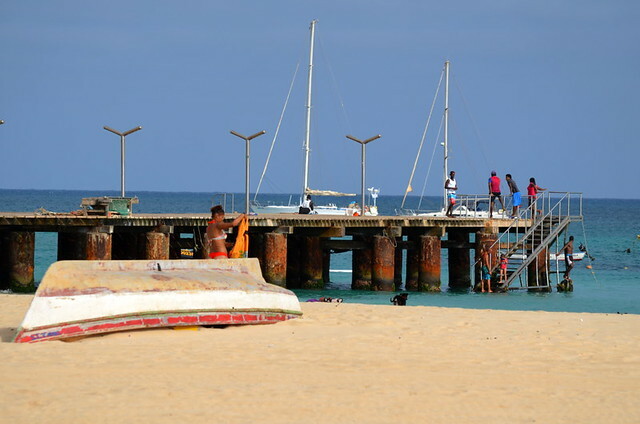 To the rest of the Cape Verdeans, Sal represents mass tourism gone wrong, but to the plane loads of visitors lured here by the ‘Caribbean without the price tag’ promise of developers and hotel chains, it can fall short. 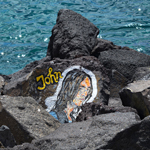 If you come here expecting Barbados or Costa Adeje you’ll be disappointed but if you come for sunshine, relaxation and beautiful beaches you’ll find everything you need – without the crowds. 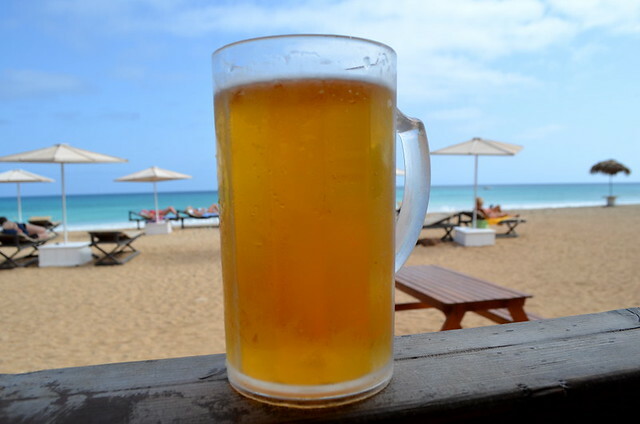 For us it meant good food, a place to exchange our Euros for Escudos and our first taste of the local Strela beer while watching windsurfers off a beach that leaves anything Tenerife’s got for dead. As I said, there are worse places to have to wait for a connecting flight. That night we returned to the airport for our onward connection to Sao Vicente where we spent the next two nights. 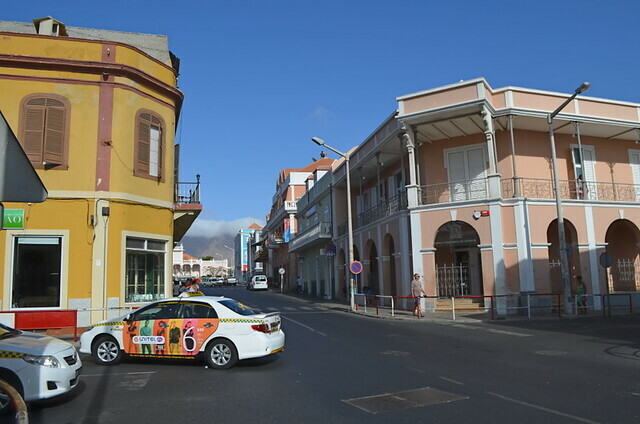 A short drive took us to the town of Mindelo where colonial architecture and leafy plazas were suddenly more synonymous with La Laguna than with neighbouring Sal yet the feel was still unmistakeably African. 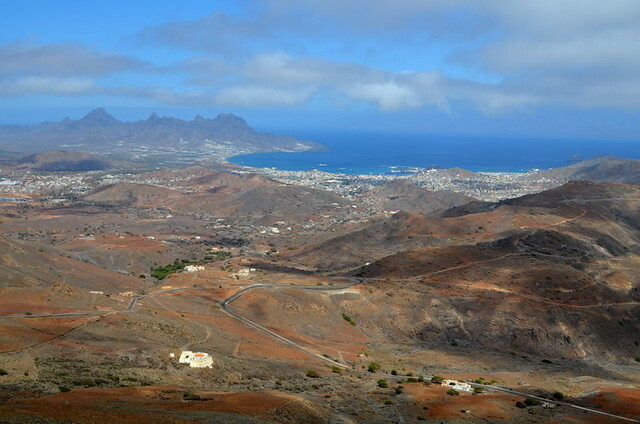 The next day we hiked from the highest point of the island to the shore, winding our way round like a cork screw as we descended accompanied by 360º views over an island that, although less barren than Sal, was very redolent of south Tenerife for its volcanic look and its arid nature. Others we met hired a local taxi, agreed a price up front, and enjoyed a full tour of the island. That evening we walked into Mindelo and explored its streets and restaurants, enjoying an excellent seafood meal right on the sea front with some traditional Cape Verdean musicians for entertainment. Our final destination was Santo Antão which we sailed to, on a Naviera Armas ferry which gave us a real sense of being back home as these are the ferries that daily cross between Tenerife and La Gomera. It was on reaching Santo Antão that the astonishing differences between islands within the Cape Verde archipelago really struck home. In parts, this was the greenest island I had set foot on since our last visit to Sri Lanka and even then, the sheer diversity of the vegetation was difficult to grasp. Like the north of Tenerife, everything seems to grow in profusion on this volcanic utopia but unlike Tenerife, a history of mono-cultures has not resulted in an excess of any one crop. 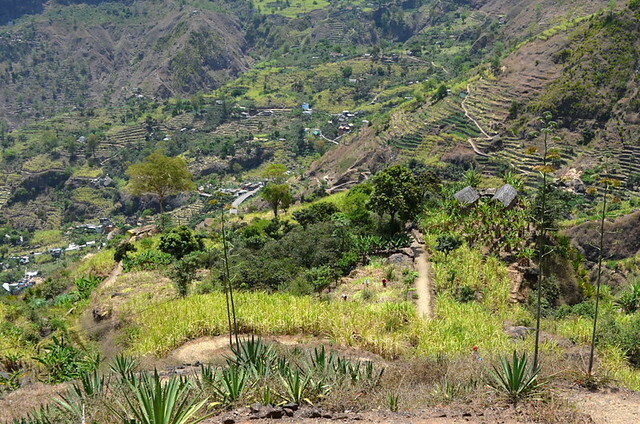 Here the valleys and hillsides are awash in so many varieties of vegetables and tropical fruits that some are left to rot on the trees. No-one goes hungry on Santo Antão. Over the next four days we enjoyed some of the most challenging and rewarding hiking we have ever experienced and met some of the friendliest and most welcoming people we’ve ever encountered on our travels. We were very sorry to leave when it came time to go home. 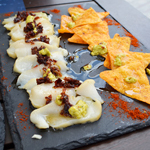 Whether you live in the Canary Islands year-round, have a second home here, or just holiday here year on year, why not hop to our southern archipelago neighbours for a visit? You’ll find a whole different world. We organised our own flights through Binter but Archipelago Choice organised everything else for us. 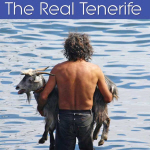 Specialists in tailor made holidays to Cape Verde and the Azores, their organisation, choice of accommodation, provision of guides and inter-island transport arrangements were all flawless. Been to both places. I always like to provide a Black African person’s perspective, as you don’t get many reviews from us as we travel the world like anybody else does. Unfortunately, the world is so color struck, and racist, the perception of anyone Black, is distorted, false, and ridiculous in nature. I am from the states, retired to Puerto Rico last year, braved Maria, still here, another color struck island. Canaries I found more developed, but racist against me just for being Black of course. I’ve got more money than most of them, more educated, but they don’t care, they’re ignorant, and misinformed. Cape Verde was more underdeveloped, but My African people embraced me there, tried teaching me the language, and I’m going back next year. I’ll never visit Canaries again. It’s just like Europe, America, Canada, Australia, for Blacks, full of racist people. I love Black Africa and Africans. This is my experience, exploring the planet, looking like me. I’ve been to 6 continents, Africa is the only accepting one of people who look like me. A lot of humans are sick, godless, and uncaring of others, for no good reason. Ka-Mugisa, I was intrigued to read a Black African’s perspective of Cape Verde, until I found I was reading a Black African’s own view of how they feel they are perceived by others. Just another Racist rant. What a shame.